TT Lympia), a 135,103-dwt turbine tanker into a floating production storage offloading facility (FPSO). Petroleum (BHP) of Australia, against com- petition from local and overseas yards. Skua Venture was the installation of a 260- ton rigid arm for the mooring system at the forecastle deck of the vessel. More than 120 tons of underdeck steel reinforcement were fabricated and installed in the bow area to support the rig arm. Sovietskaya Rossiya, a former whaling vessel converted into one of the world's largest fish factory ships. Osr GmbH, one of the marine industry's fore- most designers and suppliers of cargo secur- ing systems. The German company is based in Bremen. Conver-Osr's 'know-how' in cargo lashing systems and also their technical, consulting and engineering skills can only enhance and strengthen the group's total capacity, giving the international marine industry the benefit of an accumulation of experience and technol- ogy. Robert Bock, the founder of Conver-Osr will act as consultant and will be chairman of the advisory board. Their goals for the future include the development of lashing technol- ogy to the benefit of the shipowner, utilizing the highly skilled team of naval architects and technicians already existing within the company. Md. These systems include shipboard radio communications, mobile and airborne com- munications systems, and the fixed shore terminations of these systems. Tracor has supported fleet communication systems at NESEA since 1975. K.' > $§jlfp§? v' i§p?S-; - IS - • •-•. • •. Vesta incinerators, Aal- borg boilers and Aalborg thermal oil heaters. Ma- chining. • 26 service stations around the world. A ONE-PIECE CUSTOM-FLARED INTERIOR SKIN! Other nozzles have to be made from built-up sections or rolled plates welded together. Welds that can crack, erode, leak and fail. Our nozzles come standard with interior skins smoothly flared to your specifications from one piece of steel for smoother flow and longer life. 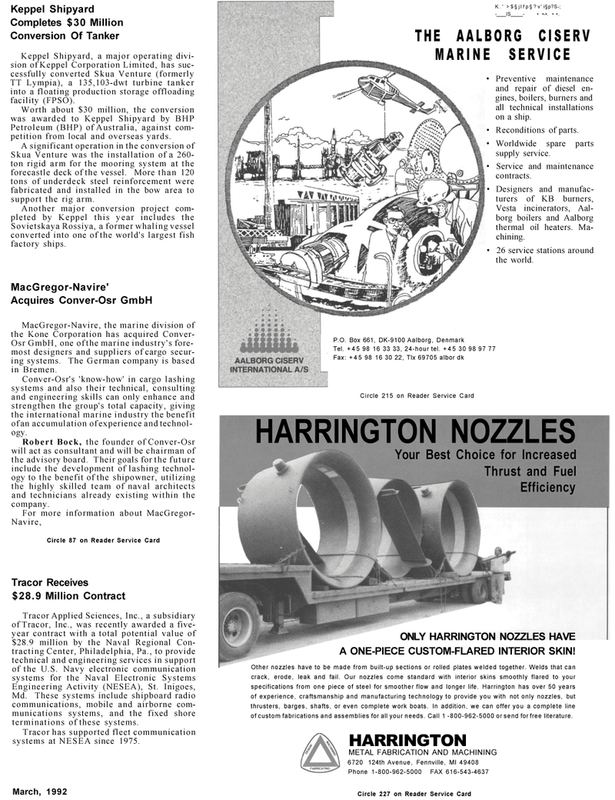 Harrington has over 50 years of experience, craftsmanship and manufacturing technology to provide you with not only nozzles, but thrusters, barges, shafts, or even complete work boats. In addition, we can offer you a complete line of custom fabrications and assemblies for all your needs. Call 1 -800-962-5000 or send for free literature.